Why does the BIO IONIC Onepass Straightening Iron Work So Well When it comes to Straightening Curly Hair? Are you tired of getting frustrated as you try and straighten your curly hair? Without a doubt straightening, curly hair can present a real challenge. It tends to be harder to mold into a straight shape than other types of hair. So what are you supposed to do to overcome this problem? For one, you can start by using a flat iron that has features that work well on straight hair. 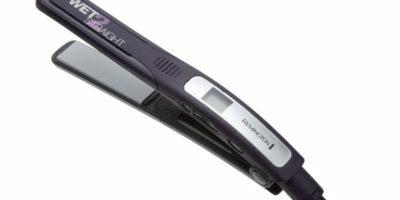 One of those flat iron models is the BIO IONIC Onepass Straightening Iron. Follow along with us as we take a closer look and review this flat iron which is said to work great at straightening curly hair. There are so many nice features on this flat iron that make it easy to use for straightening curly hair. It all starts with its five different heat settings that you have to choose from (240°F – 400°F). That means you can use it effectively on just about any type of curly hair. Its bio/ceramic heat technology also allows this flat iron to heat up in a matter of seconds and stay hot as you straighten your hair. 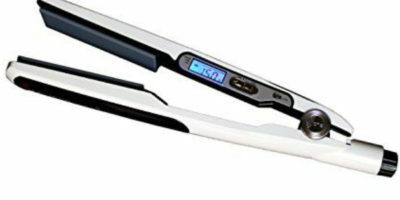 The heat plate technology on the BIO IONIC Onepass Straightening Iron is what sets it apart from many other flat irons. Not only does it have added bio/ceramic heat technology, but it also has negative ion Nano infusion (reduces frizz) and gentle heating far infrared heat generation. There are even silicone strips added to its heat plates to help your curly hair slide across them more easily as you straighten it. This flat iron is very lightweight and streamlined so it’s very easy to handle as you use it. 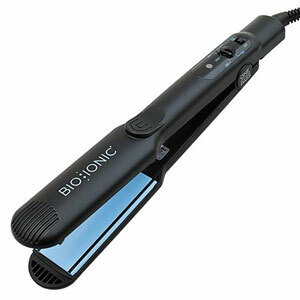 The BIO IONIC Onepass Straightening Iron weighs just a little over 1-pound. With its rounded edges and 1” plate width, it can also double as a tool that will change the shape of your natural curls. Attached to it is a 10-foot long power cord that also has a 360° swivel end installed on it. This means you have barely any movement restrictions when using the BIO IONIC Onepass Straightening Iron. That is one reason you find so many professional hair stylists using this model flat iron. Just about everything that is built into the BIO IONIC Onepass Straightening Iron makes it ideal for straightening curly hair. There are two main reasons though. One of them is its bio/ceramic technology. It helps the heat plates stay hot on each pass with this flat iron which is a must when straightening curly hair. The other main feature is its Nano ionic technology. This helps protect your curly hair from heat damage as you straighten it and it helps eliminate flyaway hairs and frizz too. Not to mention it cuts way down on curly hair moisture loss during the straightening process. The warranty you get with this flat iron is pretty incredible. You are covered for a period of 5 full years after you purchase it. That is an amazing warranty period for any type of flat iron regardless of price. We did have a few concerns with this flat iron too. 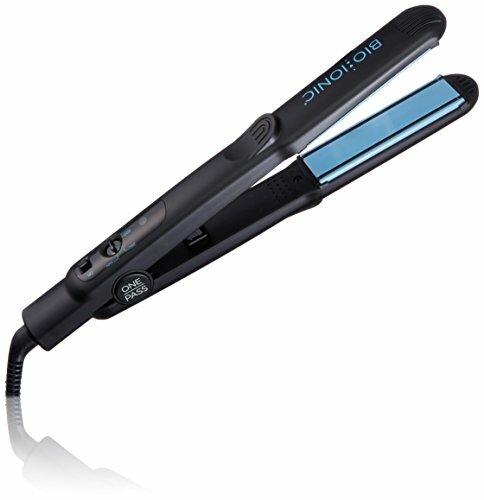 The highest heat setting on the BIO IONIC Onepass Straightening Iron is 400°F. We feel some thicker and coarser types of curly hair made need a little more heat than that to straighten them effectively. That low max heat level may explain our next complaint with this straightening iron too. It is definitely not a one-pass flat iron on thick or coarse hair types. You will still need two or three passes with this flat iron on these hair types. This flat iron is not perfect by any means but the great features it has far outweigh any drawbacks with it that we mentioned. It has enough temperature setting choices to be safely used on any type of hair and the bioceramic technology in it makes for fast and even heating. The silicone strips on its heat plates also help speed up your curly hair straightening process. It’s definitely a flat iron worth considering buying if you are shopping for a new straightener to help make straightening your curly hair go smoother.